Deep fried conical shape shapes Indian pastry stuffed with peas and potatoes. Assorted sliced vegetables coated with pea flour and batter, then deep fried. Sliced onion stirred in chickpea flour, batter and deep fried. Lamb minced with spices pressed on a skewer and cooked in tandoor. Succulent cube flavoured with exotic spices skewed and cooked in tandoor. Succulent cubes of fish flavoured with exotic spices skewed and cooked in tandoor. Spring chicken marinated in yoghurt, ginger, garlic and chillies. All items are served with basmati rice. roasted boneless chicken pieces cooked in butter and tomatoes. All items are served with basmati rice. pieces of chicken cooked in rich almond and yoghurt sauce. All items are served with basmati rice. fresh tender chicken pieces cooked in mango pulp and mild sauce. All items are served with basmati rice. succulent tandoori chicken pieces cooked in spices, gravy with green pepper and sliced onions. All items are served with basmati rice. tender pieces of chicken cooked with spinach and tomato gravy. All items are served with basmati rice. chicken pieces cooked in coconut milk in South Indian style. All items are served with basmati rice. succulent pieces of chicken marinated in Indian herbs. All items are served with basmati rice. pieces of chicken cooked in hot and sour gravy. All items are served with basmati rice. a light chicken curry cooked with onions, tomatoes and fresh coriander. All items are served with basmati rice. diced of chicken, capsicum and onions cooked with gravy. All items are served with basmati rice. pieces of lamb cooked in a rich almond and yoghurt sauce. All items are served with basmati rice. tender pieces of lamb cooked in spinach and tomatoes. All items are served with basmati rice. delicious curry prepared with tomato gravy in North Indian style. All items are served with basmati rice. 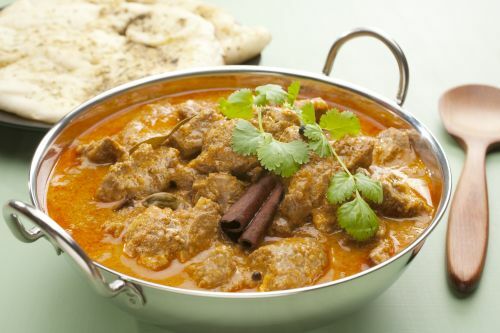 pieces of lamb cooked in rich traditional gravy. All items are served with basmati rice. diced lamb cooked in hot and sour gravy. All items are served with basmati rice. lamb mince pieces cooked in onion and tomatoes with fresh coriander. All items are served with basmati rice. Lamb pieces cooked with coconut milk in South Indian Style. a delicious curry prepared with coconut milk in South Indian style. All items are served with basmati rice. diced beef cooked in hot and sour spices. All items are served with basmati rice. light beef curry pieces cooked with onion and tomatoes with fresh coriander. All items are served with basmati rice. fish fries cooked in a thick tomato gravy and coconut. All items are served with basmati rice. prawns cooked in a traditional style with whole spices, onions and tomatoes. All items are served with basmati rice. prawns cooked in smooth tomatoes ginger sauce and butter. All items are served with basmati rice. pieces of king fish cooked with tomatoes, ginger, garlic and fresh coriander. All items are served with basmati rice. mixed vegetables cooked with mild gravy. All items are served with basmati rice. fresh mixed vegetables cooked in tomatoes and creamy gravy. All items are served with basmati rice. potatoes and cauliflower cooked in mild herbs and spices. All items are served with basmati rice. cottage cheese cooked in smooth mild gravy. All items are served with basmati rice. cottage cheese cooked with fresh puree of leafy spinach, spices and tomatoes. All items are served with basmati rice. mushroom and fresh green peas cooked with mild spices. All items are served with basmati rice. baby potatoes cooked in tomatoes and cumin seeds. All items are served with basmati rice. whole black lentils cooked in onion and tomato sauce. All items are served with basmati rice. Bread stuffed with dried fruits and nuts.